In today's modern media age the value of content is often determined by its freshness. Over the last 10 years recording artists have seem diminishing revenues from the sale of music. Many artists have offset this loss by increasing the amount of touring or by trying to build sales of branded merchandise. The live event is now as much about buy product as it is about enjoying the show. Thus LIVE duplication has never been a more important part of the product mix. 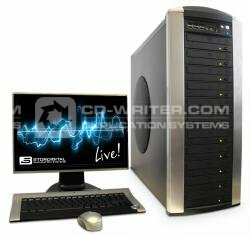 With a live duplication system from CD-writer.com it has never been faster to produce perfect LIVE CD duplicates. By using DupaLIVE concert promoters can record multiple discs live. Providing concert goers the opportunity to take away a recording of the show they have just seen. The opportunity for this technology is not just limited to music venues however. Itï¿½s perfect for conferences and churches too. We can even provide solution for the live recording and duplication of DVD video products. In today's file sharing age digital content never has more value than when recorded, distributed and retailed at source. Call CD-writer.com today to see how we can help you deliver professional and efficient live duplication service for your local venues and business.